Hisashi Kobayashi was born in Tokyo, Japan on June 13, 1938. He studied communication theory and received his B..E. and M.E. degrees in electrical engineering from the University of Tokyo in 1961 and 1963, respectively. He was a recipient of the the Sugiyama Scholarship in 1958-61 and the David Sarnoff RCA Scholarship in 1960-61. His master thesis was entitled “Ambiguity characteristic of a coded pulse radar” (advisors: the late Professors Yasuo Taki and Hiroshi Miyakawa). From 1963 till 1965 he worked for Toshiba Corporation, where he was engaged in research and development of an over horizon radar (OHR). In 1965 he came to the United States as a recipient of Orson Desaix Munn Fellowship of Princeton University and received his Ph.D. degree in electrical engineering in 1967. His Ph.D. thesis was entitled “Representation of complex-valued vector processes and their applications to estimation and detection” (advisor: Prof. John B. Thomas). He then joined the IBM Thomas J. Watson Research Center, Yorktown Heights, N.Y. as a research staff member of Applied Research Department, and worked on analysis of the LASA (large aperture seismic array) project’s data, data transmission theory, high-density digital magnetic recording theory, and image compression algorithms. From 1969 to 1970, he took his first sabbatical leave from IBM to teach graduate courses on Detection Theory and Information Theory at UCLA as a visiting assistant professor. In 1971 he was appointed Manager of the “Systems Measurement and Modeling” group, newly created in the Computer Science Department at the IBM Research Center, and was promoted to Senior Manager of “Systems Analysis and Algorithms” in 1974, and directed five groups: (i) computer performance modeling, (ii) teleprocessing and communication networks, (iii) satellite communications, (iv) computer network measurement and control, and (v) storage management and analysis. During the 1970’s Kobayashi’s own research focus shifted to queueing theory and its applications to computer systems performance evaluation. From 1975 to 1976 he was granted his second sabbatical leave from IBM and was a consultant to the Aloha System Project and a visiting professor of the University of Hawaii (July to December 1975) and then a Consulting Professor of Stanford University (January to June, 1976) where he taught graduate courses on Discrete Mathematics and Computer Performance Evaluation. In 1977 he was elected to a Fellow of IEEE (the Institute of Electronics and Electrical Engineers). In 1978 he published a graduate textbook Modeling and Analysis: an introduction to systems performance evaluation methodology (Addison Wesley). In 1979, he was awarded a U.S. Senior Scientist Award (aka Humboldt Prize) from the Alexander von Humboldt Foundation, West Germany and was invited to teach and conduct research at the Technical University of Darmstadt on his third sabbatical leave from IBM Research from September 1979 till August 1980. Then he was appointed an International Professor of Computer Science at the Free University of Brussels (ULB) from September to December 1980. In 1979 North-Holland Publisher appointed Kobayashi as the Founding Editor-in-Chief of its international journal “Performance Evaluation”. In 1980, he received a Silver Core Award from IFIP (the International Federation of Information Processing). In 1982 Kobayashi was appointed the Founding Director of IBM Japan Science Institute (JSI), later named the IBM Tokyo Research Laboratory (TRL), which was IBM Corporation’s strategic movement to expand its research arms to Asia. He directed a number of research projects in computer science/engineering and manufacturing technologies: knowledge base systems, medical information system, natural language processing, Kanji-input system, Japanese speech recognition, handwritten character recognition, image and graphics processing, communication networks, software engineering, VLSI design, parallel processing architecture, advanced workstation, and robotic systems. The number of staff grew to over 200 during his four year appointment. In 1984 he received IBM Japan’s Outstanding Contribution Award. 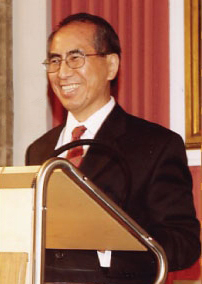 In 1985 he was appointed a member of the International Review Board, Institute of System Science, The National University of Singapore, which he served until 1998. In 1986 he was invited to join the faculty of his alma mater, Princeton University, as Dean of the School of Engineering and Applied Science (SEAS) and the Sherman Fairchild University Professor. Kobayashi arrived at Princeton during a period of rapid expansion in the engineering school in terms of research within the engineering disciplines and of new links with other fields. He played a key role in establishing interdisciplinary centers and programs in areas such as materials science, opto-electronics, earthquake engineering, surface-engineered materials, discrete mathematics for computer science and plasma etching. During the five years (1986-1991) of his tenure as Dean, the number of permanent faculty members at SEAS grew by almost 30% (from 83 to 107), the undergraduate female enrollment increased from 20% to 25%. The total sponsored research grew by as much as 60%, and corporate gifts increased by 150%. After taking a year sabbatical leave to RCAST (the Research Center for Advanced Science and Technology) of the University of Tokyo as the NEC Chair for Computers & Communications, Kobayashi assumed a full time research and teaching position in the Department of Electrical Engineering at Princeton since the Fall of 1992, and taught regularly a senior course “Digital Communication & Networks”, and graduate courses “Communication Networks,” and “Random Processes in Information Systems”. The areas of his research included (i) teletraffic theory and its applications to network performance modeling, (ii) coding and modulation schemes for wireless communications, (iii) coding and decoding schemes for high-density digital recording, (iv) architecture and protocol design of all-optical networks, (v) protocol design for network security, (vi) UWB (ultra wideband) communications, and (vii) new applications of hidden Markov models (HMM) and efficient forward-backward algorithms. He was elected a member of the Engineering Academy of Japan, and received a Short-term Visiting Program Award from the Alexander von Humboldt Foundation, Germany, both in 1992. From September 1998 till January 1999, he was a visiting professor at the University of Victoria, Canada as a visiting Fellow of British Columbia Advanced Systems Institute (ASI), which he had served as a member of its International Scientific Advisory Board from 1986-97. During his tenure as Dean and Professor at Princeton, he served on the advisory board or council of a number of institutions including, NASA (National Aeronautics and Space Administration), Washington, D.C., 1990-92; SRI International at Menlo Park, California, 1988-91; Electrical Engineering Department, University of Pennsylvania, 1987-92; School of Engineering, Duke University, 1998-2001; Kent Ridge Digital Laboratory (KRDL), Singapore, 1998-2001, Advanced Institute of Science and Technology (AIST), Ministry of Economy, Trade and Industry (METI), Japan, 2001-2005; The 21st Century Center of Excellence Program, Ministry of Culture and Education, Japan, 2001-2009; as for his other professional appointments, see the section on Professional Services and Appointments. He received the 2005 Technology Award, together with François Dolivo and Evangelos Eleftheriou of IBM Zurich Lab, from the Eduard Rhein Foundation, Germany, for his invention and fundamental theory developed in 1970 that culminated in the development of the PRML (partial response coding, maximum likelihood decoding) technology that allowed dramatic increases in storage capacity of computer hard disks. Kobayashi turned to emeritus status in June 2008. But he continued to teach a graduate course on “Random Processes for Information Systems” until 2013 as a visiting lecturer. Since September 2008 to present he has been Distinguished Senior Researcher at NICT (the National Institute of Information and Communications Technology, Japan where he advises their Future Internet Project. Kobayashi has recently published two textbooks based on his lecture notes. System Modeling and Analysis: Foundations for System Performance Evaluation (Pearson/Prentice Hall, 2009, 782 pages) coauthored by Prof. Brian L. Mark (George Mason University) was published in April 2008, and Probability, Random Processes and Statistical Analysis (Cambridge University Press, 2012, 812 pages) coauthored by Brian L. Mark and William Turin (AT&T Lab Research). See the section on Publications for a complete list of books, book chapters journal and conference publications, keynote speeches and other publications. Kobayashi was a guest speaker at the opening ceremony of the Graduate School of the University of Tokyo held at the Budokan, Tokyo in April 2010. From April 2011 till September 2015, he served as the president of “Friends of UTokyo, Inc. (FUTI),” a New York based NPO established in 2008 to promote the internationalization of the University of Tokyo (UTokyo) through exchanges of students of UTokyo and U.S. universities. He currently serves as the Chair of its Advisory Committee. He also serves on the Board of Directors of Armstrong Memorial Research Foundation, Inc. , associated with Columbia University and on the Review Board of MobilityFirst , an NSF funded Future Internet Architecture project of WINLAB at Rutgers University. From 2009 to 2014 he served on the Advisory Board for German Lab (G-Lab), a German effort on Future Internet. He was Advisor for the President of Toyota Technological Institute, Nagoya, Japan from 2009 to 2013. Kobayashi’s latest technical speeches include the speech at the Opening Exercise of the Graduate School of University of Tokyo in April 2010; keynote speech at Euroview, Würzburg, Germany, July 2012; Keynote speech at the 24th ITC (International Traffic Congress), Krakow, Poland, September 2012, and an invited speech “Big Data and Future Networks,” at the 7th New Generation Network Promotion Forum, in Tokyo, January 2013. Kobayashi is a Conference Co-Chair of the 28th ITC to be held in Würzburg, September 2016. The mathematician Shoshichi Kobayashi (1932-2012) was his elder brother. Hisashi established the Shoshichi Kobayashi Memorial Website and contributed an invited book chapter and memoirs in his honor.